If you think your system is not operating as it should, the FIRST thing you need to check is your air filter! 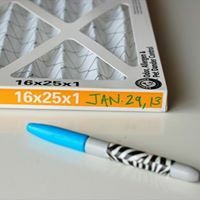 It is important that you visually check your filter(s) every month. During peak seasons, when your system runs more often, you may need to change your filter(s) monthly. There are many factors that can affect the life of your filter, i.e. pets, carpeting, open windows and doors, remodeling, even seasonal cleaning can lift more settled particles into your home’s environment. 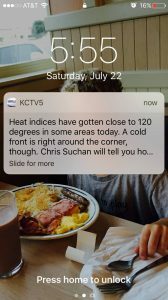 Do you like to set your thermostat low in the peak of summer, and get frustrated when your A/C cannot keep your home as cool as you normally like it? Generally speaking an air conditioning system is designed to accommodate up to a 20 degree difference between the outside air and inside air while still keeping around a 55% humidity level which is comfortable. This means that if it’s 80 outside your A/C can easily reach 70 degrees, since that is only a 10 degree temperature difference. So even if it is 90 degrees out, your air conditioner should still easily reach the 70 degree mark. However, if it is 100 degrees outside, it will be nearly impossible to reach 70 degrees inside without the air conditioner working overtime. We get many calls on days of 100+ degree temperatures from customers wondering if they actually have a problem or just unrealistic expectations. If you have your air conditioner set to a temperature that makes that differential more than twenty degrees you will likely run your A/C all day long, and still not quite reach those desired temperatures. This becomes a waste of money on your end, by overusing a system that was not designed to accommodate what you are trying to do. A good rule of thumb is during the hottest days when the dial reaches 100 degrees, it is best to set your A/C to somewhere between 75 and 80 degrees. You can also supplement that slight temperature difference with closed curtains on sunny side of the building, running ceiling fans and portable fans in rooms which people are present, and avoid using household appliances that produce extra heat in your home. Additionally, make certain that your A/C is properly maintained in order to eliminate the possibility of losing efficiency and money through items which could have been easily fixed like replacing dirty filters and cleaning coils. WHAT DOES YOUR FURNACE CONDENSATE DRAIN LINE LOOK LIKE? 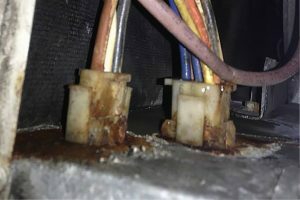 Pride Mechanical, Inc technicians frequently find poly tubing condensate drain lines clogging with water damage corroding furnaces & electrical wiring. If you have poly tubing that is getting old, it may be a good idea to replace with new tubing. To upgrade your condensate drain line, PVC can be used in place of poly tubing. It is always a good idea to make sure your drain line is clear & free of debris build up, especially if you do not have annual maintenance done by a professional. Unseen water leaks can lead to major damage. Was your system running fine, & then just stopped for no apparent reason? There is nothing worse then calling a professional and paying a trip charge for something you could have easily assessed on your own. Commonly we find people calling with a blank thermostat or inter-mitten issues. Just like your TV remote, your thermostat can take batteries depending on the model. It is always a good idea to change your thermostat batteries once a year to avoid a NO HEAT or NO COOL situation. Batteries are much more inexpensive when they don’t have a trip charge added on to the cost of them, & are changed by you. Shown here is the main electrical “light switch” shut off to the furnace. Another common issue that sparks many unneeded service calls is tripped breakers. If your system is not running check your break box for any tripped breakers that may need reset. Every time a storm rolls through we notice a higher call volume from customers that may not need someone to come out. If there are power surges in the area, breakers can trip causing your system to lose power. Some times getting new appliances or moving things around your home on different outlets can trip a breaker, & cause power to your system to be cut off as well. 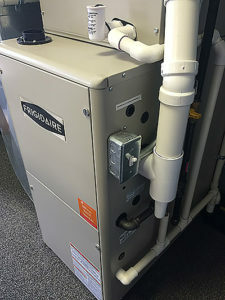 We have seen a main power switch at the furnace get flipped to the OFF position and gone unnoticed until the extreme heat or cold comes & the homeowner notices the system is not running. If your furnace is up to recent standard code, you will have a direct electrical shut off at the furnace. Most of the time this will look like a standard home’s light switch placed on a small box at the side of the furnace. If your system is not running you can make sure the switch did not get turned off. We have ran service calls where a pet or person walking by the furnace flipped this switch to the off position by simply brushing against it. Some thermostats can take up to 10-15 minutes to reconnect to the HVAC equipment depending on what your home has, so give it a little time to fully reset before moving on.